All of the elements have also been read as native ArchiCAD elements with all of their relevant ifc data intact this should allow us to easily check all the associated information at the same time as the geometry without the need for different document sets. 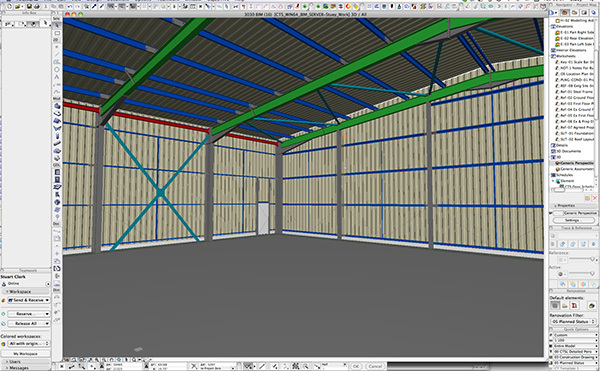 Above are a couple of screen shots taken in ArchiCAD of a project we’re working on in Lutterworth.The image shows how a model created in Tekla Structures can be exported as an IFC and opened in ArchiCAD. What’s interesting about this is that all of the data is intact, editable and the elements have all been translated into NATIVE ArchiCAD elements. This translation works BOTH ways. We normally segregate the data by the people who created it in order to keep responsibility and liability clear, but for anyone questioning the principle, this show clearly that the workflow is possible, predictable, and stable if enough care is taken.